my 8" Dobsonian telescope and 12mp Fujifilm digital camera. August 10, 2011 9:22 P.M. 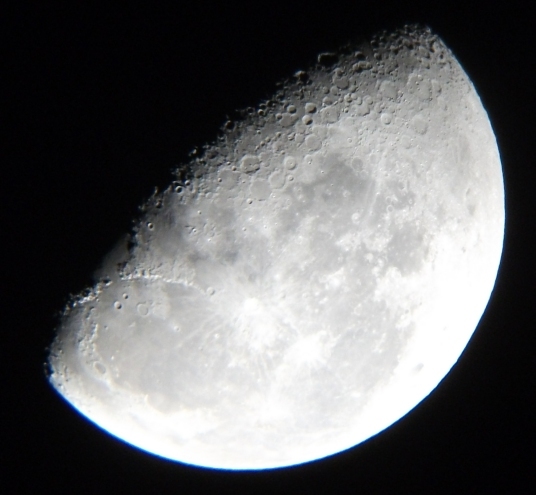 While trying to get off a shot of the moon (and not having much luck) the camera picked this up. No, I doubt it's E.T., it's most likely a satellite or a piece of "space junk", I.E. a rocket booster, broken satellite, whatever. It's probably not a meteor either; there would be a trail behind it. It looks reflective, so chances are it's metal. 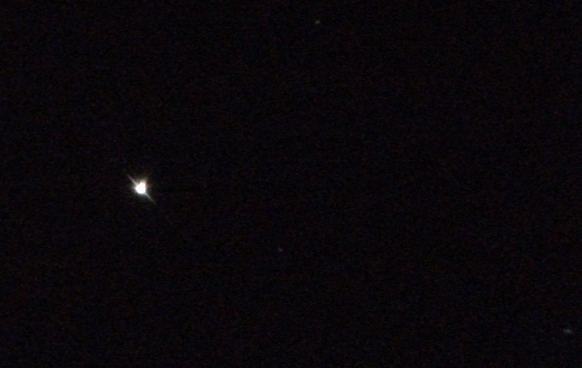 The first shot is just what the camera got scaled down, and the one below is of the "object" at 1:1. *** The pics on this camera are taken at 4000 X 3000 pixels, which is kind of impractical to view at full size on a web page, hence the scaling and cropping. August 20, 2011 4:59 A.M.
A half-decent shot of a half moon. Hard object to photograph as it's so reflective. At the bottom left you can see the Apennine Mountains, pointing to Copernicus Crater. And no, you unfortunately cannot see any Apollo landers through a telescope. September 11, 2011 12:21 A.M.
December 12, 2011 9:12 P.M. 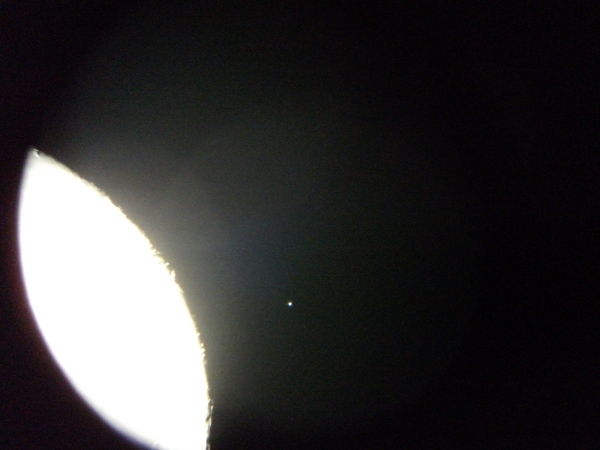 This is the star Aldebaran; it's in the constellation of Taurus and sits about 65 light years away. Quite bright. December 15, 2011 6:14 P.M. 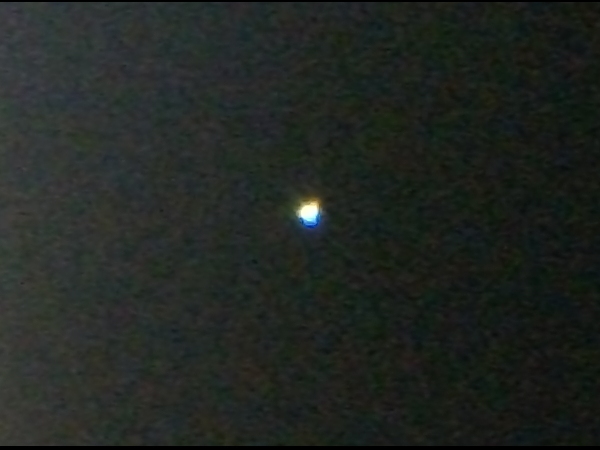 This pictue of Venus was taken about a half an hour after sunset, which is a very bad time to try for a photo. Especially when the planet you want to photograph is in the west, right above where the sun just set! Still, with a little more than half the planet reflecting the sun, I thought it came out well. Besides being the most reflective planet in the solar system, it's also one of the most boring to look at due to a thick cloud cover of carbon dioxide. December 17, 2011 10:22 P.M. This is Jupiter, largest planet in our system. I have taken over 50 photo's of this gas giant, and this is the best yet. Fuzzy, I know, but you can see the cloud belts. Considering the light pollution where I live, my method of photography (camera to the eyepiece, press the shutter and hope), and the fact that this planet is, or was, 743 million kilometers away, I think it came out alright. December 17, 2011 10:25 P.M. 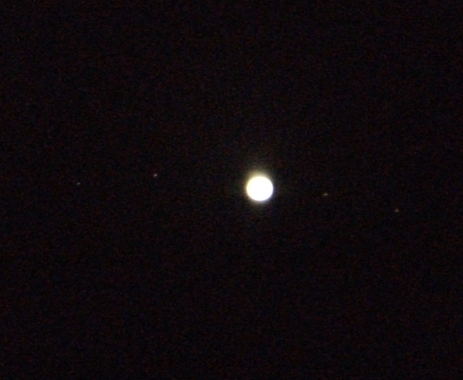 Here's a low-exposure and low-magnification shot of Jupiter and the four "Galilean" moons. 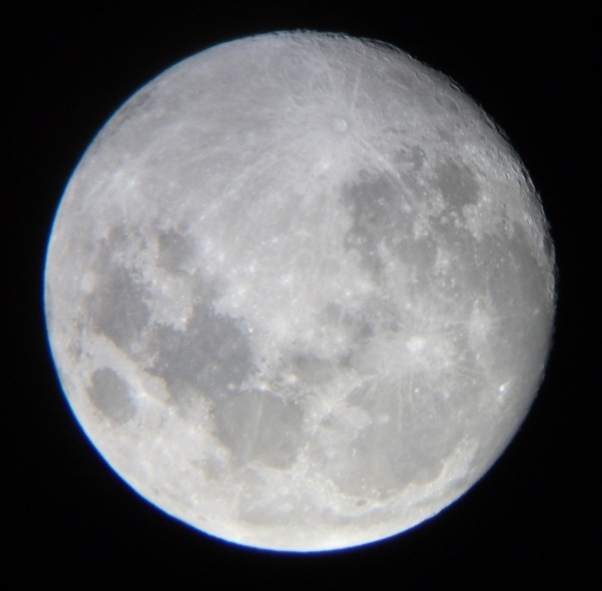 This is pretty much what Galileo saw in 1609 through his improved telescope. Even though Jupiter has 62 moons, these are all you'll see through any telescope. 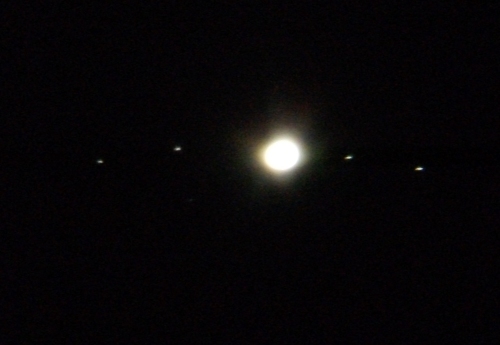 From left to right, the moons are named Callisto, Europa, Io, and Ganymede. December 17, 2011 10:26 P.M. Same view a minute later with a longer exposure. Much brighter, but now the moons appear as streaks due to the fact that, while the shutter's open, everything is still in motion. Ahhh, the fine lines of on-the-cheap astral photography.